Combination therapy with ACE-inhibitors (ACE-I) and Angiotensin receptor blockers (ARBs) have individually been shown to decrease proteinuria and prolong renal survival in proteinuric renal disease. However, neither agent can completely block the renin-angiotensin-aldosterone system (RAAS), and studies have shown that various combinations of dual RAAS blockade using ACE-I, ARBs, mineralocorticoid-receptor antagonists, and direct renin inhibitors lead to enhanced decrements in blood pressure and albuminuria. This lead to the hypothesis that patients with type 2 diabetes and overt nephropathy may benefit from combination therapy to slow CKD progression as compared to a single agent alone. 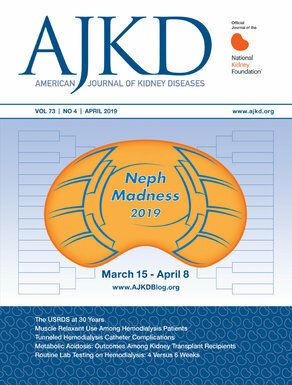 Subsequently, ONTARGET (discussed by Nate) and ALTITUDE (ranked #4 among the Top Nephrology Stories of 2012) both failed to demonstrate renal and/or cardiovascular benefits from such combination regimens, and instead showed increased adverse events, eg, hyperkalemia, acute dialysis and hypotension. In fact ALTITUDE was terminated early due to the lack of apparent benefit and higher risk of adverse events with dual therapy. These studies however, were criticized for having significant limitations, eg, normal albumin excretion (ONTARGET), and although the patients in ALTITUDE had DM and kidney disease, they were not necessarily proteinuric. The VA NEPHRON D (Veterans Affairs Nephropathy in Diabetes study) was conducted as a randomized double blind multi-center clinical trial designed to particularly determine the effect of combination therapy with ACEI and ARBs in type 2 DM patients with overt nephropathy, on CKD progression. The study involved 1,448 veterans, the majority of whom were male, with type 2 DM, albuminuria (mean albuminuria 852 mg/gm), and stage 2 or 3 CKD (mean eGFR 54 mL/min), with a mean age of 64 years, followed for a median of 2.2 years. All the patients received losartan 100 mg/day and were randomly assigned to placebo or lisinopril 10 to 40 mg/day. The primary endpoint was a composite of a 50 % decline in eGFR (or a drop > 30 mL/min), dialysis, or death. These are the same valid end points as used in RENAAL and IDNT. There were no difference in the primary end point of CKD progression or death (152 vs 132; P=0.30). There was however significant increases in adverse events attributed to the drugs (P=0.049). There was an impressive increase in hyperkalemia with combination therapy vs losartan alone (6.3 vs 2.6 events/100 person-years; P<0.001). They also had nearly a doubling of acute renal failure (12.2 vs 6.7 events/100 person-years; P<0.001). Acute renal failure was defined as requiring hospitalization or occurring in the hospital. This was not some meaningless bump in creatinine. Because of the unfavorable risk benefit ratio, the study was terminated early, in October 2012 (similar to ALTITUDE). As a nephrologist, the previous idea of combination therapy with ACE-I and ARB always made practical sense, although this notion was based on presumed beneficial changes in “surrogate endpoints,” eg, blood pressure, proteinuria, and even endothelial dysfunction. In fact, prior to ONTARGET and ALTITUDE, despite questionable safety and efficacy of such combination regimen, several heart failure and diabetes guidelines also alluded to this practice, thereby paving the way for its common use in patients with hypertension and diabetes or proteinuria, or both and even in those with heart failure who were deemed resistant to treatment. This therapy was also used in some with uncomplicated essential hypertension. In the final analysis, it appears that the presumed benefits previously ascribed to combination therapy were primarily based on studies utilizing surrogate endpoints, which have been notorious in not representing hard outcomes. I think this is a very important study and my vote for top nephrology story of 2013. NEPHRON-D not only changes a common practice pattern that many nephrologists (including myself) ascribed to in the name of ‘renoprotection,’ but it also questions some of the guideline making policies of various work groups. As a clinical nephrologist, we should not take guidelines at face value but we also have to be cognizant of the methodology that results in the guideline. I believe we are closing the door on a decade long therapy: RIP dual RAAS blockade. Go to Renal Fellow Network and make your pick for the top story of 2013! Edgar V. Lerma, MD, eAJKD Guest Contributor.